Goals from Will Grigg, James Vaughasn and Nick Powell sent Wigan Athletic back to the top of League One - ahead of Shrewsbury’s clash at Rochdale - thanks to a routine 3-0 victory over Oldham at the DW. The ‘other’ Latics asked a couple of questions in the first half without really threatening Christian Walton’s goal, aside from a solitary strike from Eoin Doyle that was well snaffled. And there was always a sense that the floodgates would open once Grigg converted Powell’s delivery with aplomb five minutes before half-time. Grigg failed to reappear for the second half, with Vaughan taking his place in the lone striker’s role. And the new man benefited from a catastrophic piece of defending within four minutes of the restart to double the advantage. Powell made it three with a strike of pure footballing arrogance on 66 minutes to put the visitors out of their misery - and send the ‘real’ Latics back to the summit. And with only nine games to go, Latics remain in control of their destiny - with their promotion rivals hoping for a slip-up. 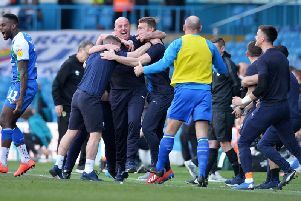 However, with five wins in a row behind them, Paul Cook’s men are playing with a swagger befitting of their pole position. For some reason the visiting defence parted like the Red Sea to allow Powell into the area, and his shot was tipped round the post by Placide. From the resulting corner, Powell’s free header was half-stopped, with the ball then headed goalwards by Ryan Colclough. Grigg looked like he was fouled as he tried to slot home the rebound, but only a goal-kick was given. Colclough was getting plenty of joy against Oldham right-back Rob Hunt, beating him on several occasions as the visitors tried to help their struggling colleague. From another Max Power set-piece, Powell rose at the far post only for Chey Dunkley to clean him out before heading wide himself. Oldham had a rare sight of goal when Doyle did well down the right before finding Davies at the far post. But he was always stretching and the shot lacked any real power. Back came Latics and, after Powell and Jacobs had seen efforts saved, the opening goal eventually arrived five minutes before the interval. That was Grigg’s involvement, with a calf niggle meaning he wasn’t risked for the second half. However, replacement Vaughan wasted only four minutes in doubling the lead after some pantomime defending in the visiting ranks. From then on, it was only ever a matter of how many Latics would score, with Oldham seemingly content to avoid further damage. Perhaps with one eye on Monday’s trip to Portsmouth, Colclough was replaced by Gavin Massey, with ex-Wigan man Davies also coming off for Oldham - to a very generous ovation from the home fans. After a prolonged period of keep-ball, Latics did decide they could do with a third goal to add the icing on the cake. And it was Powell who came up with the goal his all-round display thoroughly deserved. Picking the ball up wide on the left wing, just inside the Oldham half, the forward glided effortlessly into the box, away from several would-be tacklers, before picking the perfect moment to fire low into the bottom corner of the net. His celebration was just as nonchalant, and the standing ovation he received shortly after - when he was replaced by Gary Roberts - said everything about his status as Wigan’s Mr X Factor.